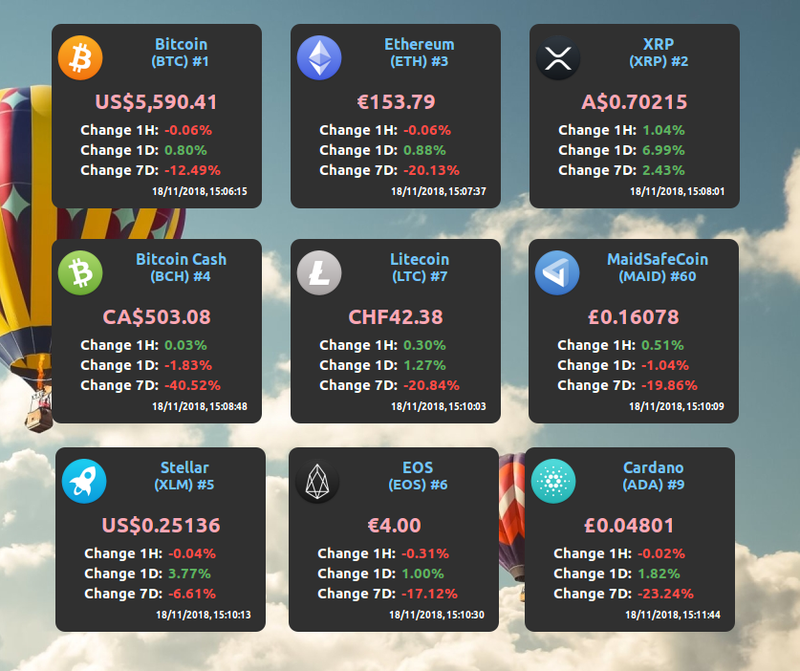 Cinnamon Desklet that displays the current price of more than 500+ crypto coins and their daily percent changes. NOTE: It is also possible to install the Desklet manually by copying the files/cryptocoins@pbojan folder to ~/.local/share/cinnamon/desklets/ but it is recommended to use the steps above to always get the latest version! NOTE: You can add up to 10 different instances of the Desklet and select different coins for them! NOTE: The ticker refreshes by default every 30 minutes. Every refresh uses one credit per coin ticker, plan you montlhy credits limit accordingly! If you find any bugs or stability issues please create an issue here or send an email to p.bojan@live.com. If you have ideas for new features or improvements please send an email to p.bojan@live.com. If you want to support the work and maintenance of this crypto Ticker, please consider donating. Every donation is highly appreciated! Can't donate but you still want to help? Report a bug or even better solve one or improve this Crypto Ticker by creating a pull request. If you want to add new features please first send an email to p.bojan@live.com and describe your idea. Hey, there was one bug with parsing the dates from the API in the newest version of the Ticker and it was fixed in https://github.com/linuxmint/cinnamon-spices-desklets/pull/381. Wait until the PR is merged and update your Ticker if you want to give it another chance. Thanks for reporting the issue. All of a sudden the new release needs an API-Key to be entered in settings for which a registration on coinmarketcap is required. The old release doesnt need such API-Key I dont see any reason why i should get me an API-Key while the old desklet-version works without Key.. Thats why I just downgraded the desklet..
Hey, the public API is not supported anymore and it was announced that it will be shut down on 4th of December, 2018. They haven't shut down the API yet but they will probably do it in the near future. With the newest version (1.2v) the ticker was migrated to the new Pro API which sadly requires a registration and has request limit build-in but also has a free tier account. Thank you very much! It is very useful desklet for me, but how to add some cryptocurrensies that is not in current list (for example, KARBO and Pascalcoin)? Hey, thank you for the feedback! I added those two coins and much more (now around 230 coins available). Wait few days until the code is published and just update your desklet. Thank you!!! I was really hoping someone made something like this, and it works flawlessly, great work! You are welcome! It is great to see someone else finds this desklet useful.